• Start with lines of at least 3 in every corner. • Player 1 passes to the right hand side, from baseline corner to midline corner to player 2. • Player 1 crosses court diagonally. 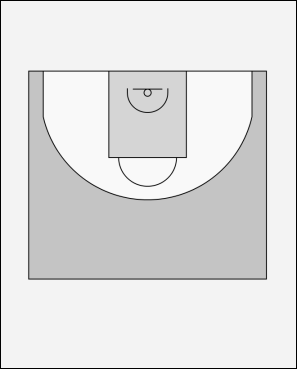 • Player 2 at mid court passes to player 3 at his right and crosses court diagonally. • Player 3 at mid court passes to player 4 at his right and starts playing offense on player 1. • As soon as player 4 receives the ball he tries to go to the basket, player 2 must play defense. • If there is no lay-up it's 2 on 2. • - Every player rotates to the right. Emphasize that passers run fast to their offensive opponents.